A grand jury in Columbus, Ohio, declined on Friday to indict a white police officer who fatally shot a 13-year-old black boy who was brandishing a BB gun, finding that the officer’s actions were justified, city officials and the police said. The officer, Bryan Mason, had chased Tyre King into an alley on Sept. 14 and when the teenager pulled the BB gun from his waistband, the officer opened fire, striking Tyre multiple times, the authorities said. Mr. Mason, a nine-year veteran of the Columbus Police Department at the time, had fatally shot a man in 2012; his superiors cleared him of any wrongdoing in that episode, but placed him on administrative leave after the September killing. The shooting quickly polarized the public, as people rallied behind either the officer or the boy. Officials in state’s capital found themselves pleading for patience, acutely aware of the unrest that has sometimes followed police shootings that have claimed the lives of black men. 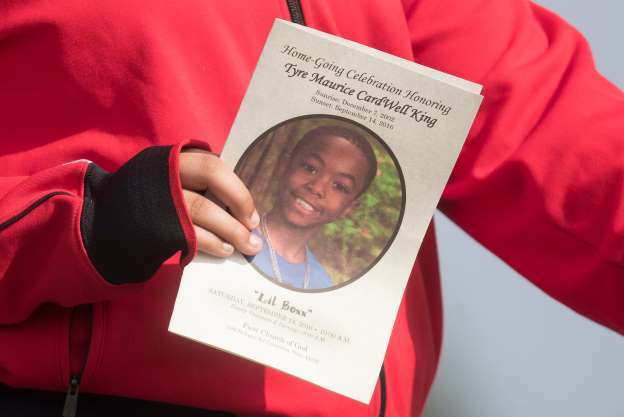 Some had drawn parallels between the shooting of Tyre and the 2014 shooting death of Tamir Rice, 12, who was playing with a pellet gun in a park in Cleveland. Sean Walton, a lawyer representing the King family, said they were not surprised by the grand jury’s decision, calling the process flawed. He said the family had called for an independent investigation into the shooting and believes the Columbus Police Department and county prosecutor’s office should have stepped aside. The Columbus Police Department did not release a statement Friday, but the department confirmed that the grand jury had decided not to file charges against the officer. After the shooting, the authorities said officers had responded to a report of an armed robbery in the Olde Towne East neighborhood in central Columbus.